In the previous article (http://ponnadi.blogspot.in/2013/06/anthimopaya-nishtai-7.html), we observed nampiLLai's greatness through several incidents in his life. We will now observe the most wonderful incident in the lives of our pUrvAchAryas. Thus, namperumAL and others heard thiruvAimozhi kAlapkshEpam (with 36000 padi and all the other 4 vyAkyAnams) for a whole year (10 months), without any interruption. Again, on the final day - on Ani mUlam day, namperumAL arrived with everyone in the maNdapam and hears jIyar performing the most grandeur and wonderful sARRumuRai. It is world-renown that After that, namperumAL, being very pleased with jIyar, he gave great honors to mAmunigaL (Translator's note: by offering him his own sEsha paryankam and srIsailEsa dhayApAthram thanian - thus accepting mAmunigaL as his AchAryan and immediately propagating this thanian to all the dhivyadhEsams). This is why jIyar says with great humility and gratitude reflecting on the divine/special blessing which was given to him by namperumAL for engaging him in this great kainkaryam. Who am I? What are the glories of this periya thirumaNdapam? It is a great blessing for namperumAL himself, with great affection, to ordain me to explain the divine meanings of dhrAvida vEdham (thiruvAimozhi through 36000 padi) every day (for the whole year). Similarly, the great AchAryas/srIvaishNavas of those days who were greatly attached to mAmunigaL declared as follows. nalangadal vaNNan munnE thamizh vEdham naviRRananE. நலங்கடல் வண்ணன் முன்னே தமிழ் வேதம் நவிற்றனனே. 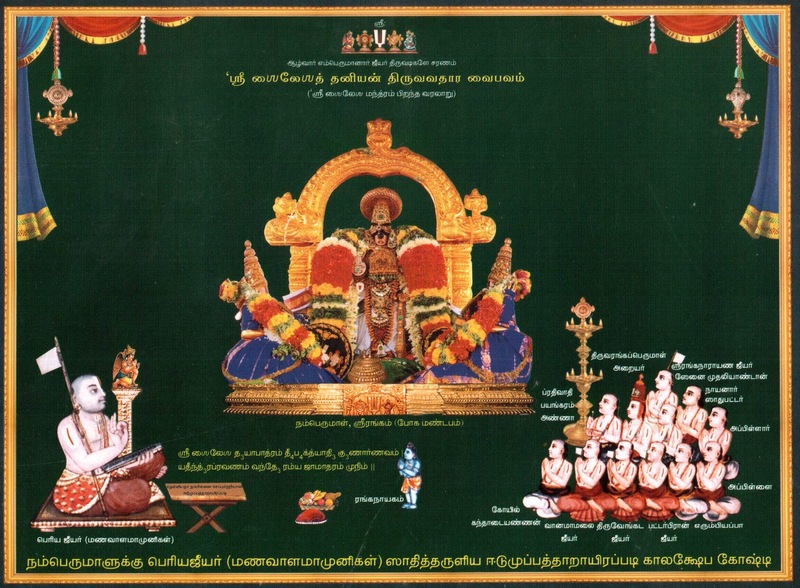 mAmunigaL who was surrounded by many thousands of his disciples lived in srIrangam and explained the meanings of thamizh vEdham in front of emperumAn. To do this, first, the beautiful srIranganAthan, invited maNavALa mAmunigaL into his periya thirumaNdapam and benedicted him to reveal the most beautiful meanings of thiruvAimozhi there. Thus, his sishyas showed their gratitude towards mAmunigaL and also cherished the divine act of namperumAL where he did great favours that were not done to any one other than our jIyar (mAmunigaL). Translator's note: Thus, we have seen the divine incident of namperumAL's glorification/honoring of periya jIyar on Ani thirumUlam day by submitting unto him, accepting him as his AchAryan, offering him his own sEsha paryankam and more than anything else offering the most glorious thanian "srIsailEsa dhayApAthram dhIbhakthyAdhi guNArNavam, yathIndhra pravaNam vandhE ramya jAmAtharam munim" (ஸ்ரீசைலேச தயாபாத்ரம் தீபக்த்யாதி குணார்ணவம், யதீந்த்ர ப்ரவணம் வந்தே ரம்ய ஜாமாதரம் முநிம்) and propagating the same to all the dhivyadhEsams, etc. namperumAL himself practically demonstrating his anthimOpAya nishtai towards his AchAryan (mAmunigaL) for the whole world to see and follow the same. Full series can be viewed at: http://ponnadi.blogspot.in/p/anthimopaya-nishtai.html.